The name Winkie sounds like the name a child would give a pet or the name of a nervous clown. Winkie is in fact the vision of the noise-pop duo from Brooklyn, New York that go by Gina Spiteri-Santiago and Peter Santiago. They describe their music as the sound of drowning, imagery reflected on the cover of their second full-length album, Come To My Party. It’s an image of the drowning hand—it’s either reaching up to be saved or disappearing into the abyss. It’s either rescue or death. Winkie could care less either way. By the time you get your head wrapped around the silly name, your senses get dump-trucked by the shoegaze wall-of-sound made up of layers of tangled bass, cold percussion, dark gothic synth lines, distorted fuzz and what sounds like an air raid siren. This is all juxtaposed by the sweet, ethereal voice of Gina, who uses her vocals as an instrument that weaves through the chaos, making sense of all the destruction. Take away the noise and add a simple piano you might have an album of compelling, emotional torch songs. You still get the torch, but it is consumed by the napalm fire that Gina and Peter build. This isn’t an album that delivers delicious radio friendly pop hooks that give you the perfect sugar buzz to make it through a long summer night road trip. It is also not an album that is going to deliver inspirational lyrics to make you feel good about the world and your place in it. Come To My Party is an invitation. It’s definitely not an invitation to a party with balloons and frosted cakes with kids from school giving you hastily bought presents from the thrift store. This party is more like a meat grinder with strobe lights. The song titles sound like they could find homes on classic Smiths albums: “I Will Not Weep For Any Throne You Fall From,” “Only The Night People Know,” “All Night They Dreamed Of Revenge” and “Drowning. Alone?” All songs that could easily be ripped from Morrissey‘s songbook. “Tasting My Heart For The First Time” is one of the standout tracks on the album. Gina wails on the opening lines of the song “Goodbye to me tonight / It’s hard to stay alive tonight.” It’s a song about giving up to the vast ocean that surrounds you and pulls you down. like drowning. 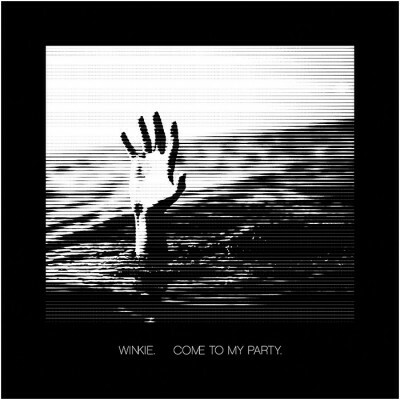 Winkie describes their sound as “A definite hit for those who like their music with a touch of bleak.” They are right, but it’s not just a touch—it’s a punch in the face with brass knuckles. This is the perfect album at the right time of year as Winter’s deathly hand reaches out to the unsteady nature of Spring. Sun and storm, often at the same time. The sound of Winkie.